Xojo Cloud is a fast, easy way to deploy your Xojo web apps. To use Xojo Cloud you will need to have a Web license and have purchased a Xojo Cloud server. Make sure you sign in to the Xojo IDE using your Xojo Account. To start using your Xojo Cloud, you need to deploy a web app to it. Here's how you can create a simple web app to try it out. Create a new Web project and drag some controls onto WebPage1. 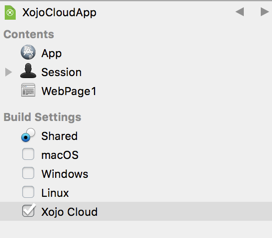 In the Build Settings section of the Navigator, select Xojo Cloud. Choose your Xojo Cloud server from the drop-down menu using the Inspector on the right. Click the Deploy button on the toolbar (or choose Deploy from the Project menu) to build your web app and deploy it to Xojo Cloud. Xojo will open your default web browser to the URL of your deployed app when the deployment has finished. Check out the Eddie's Electronics app to see a Xojo Web app running on Xojo Cloud. If you require technical support for your Xojo Cloud server, contact support. Visit the Xojo Store to purchase your own Xojo Cloud. After this initial deployment, to deploy again you only need to click the Deploy button on the toolbar. You can upload as many apps to your Xojo Cloud server as its available memory and server capacity allows. The built app's name has a suffix if the Stage Code (in the Shared Build Settings) is set to Development (-Dev), Alpha (-Alpha) or Beta (-Beta). This allows you to deploy apps for testing without affecting an app that is running in production. Set the Stage Code to “Final” to remove any suffix. These ports need to be open in your firewall in order for the Xojo IDE to communicate with the Xojo Cloud server: 54322 and 54320. This page was last edited on 29 January 2019, at 13:44.